Let it be Fall. I realize I have been harping on Summer until the last drop. It’s only because I cherish those last moments of seasons, and I want to take advantage of those last moments each season has to offer. Fall tomatoes, fall peaches, peppers, and hints of the newly arriving season creeping in on us. I wish to cherish that, avoiding the take for granted ordeal. So I pause and then I make soup. Although there are peaches on our counter as I write, and a basket of cherry tomatoes from the farmers markets, I still make soup. I find the balance of appreciating what a great Summer it has been versus the start of a sweet crisp Fall. It’s time to slow down a bit, get ready for the seasons to change. While the weather is glorious in it’s own right all year long, for different reasons, I love Fall. I like slowing down, blankets, soup, squash, apples, greens, and more hot beverages. The colors, I adore. 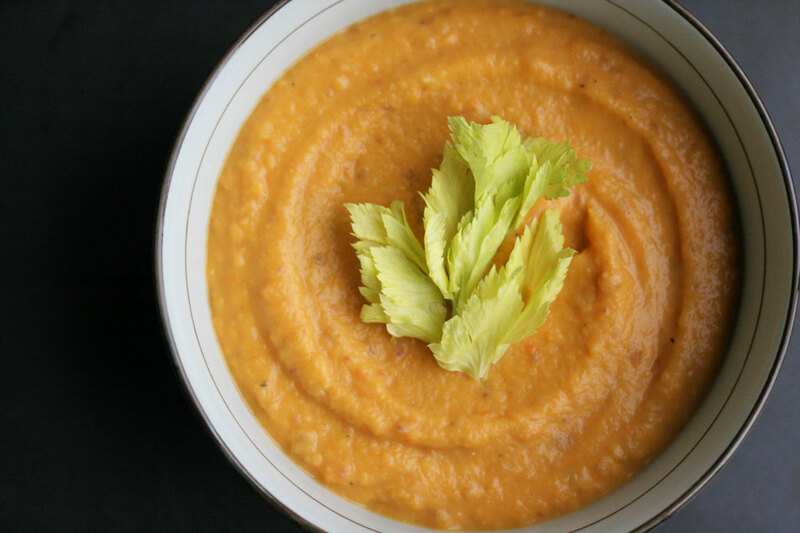 The colors of this sweetpotato soup sing Fall, and the flavors even more. 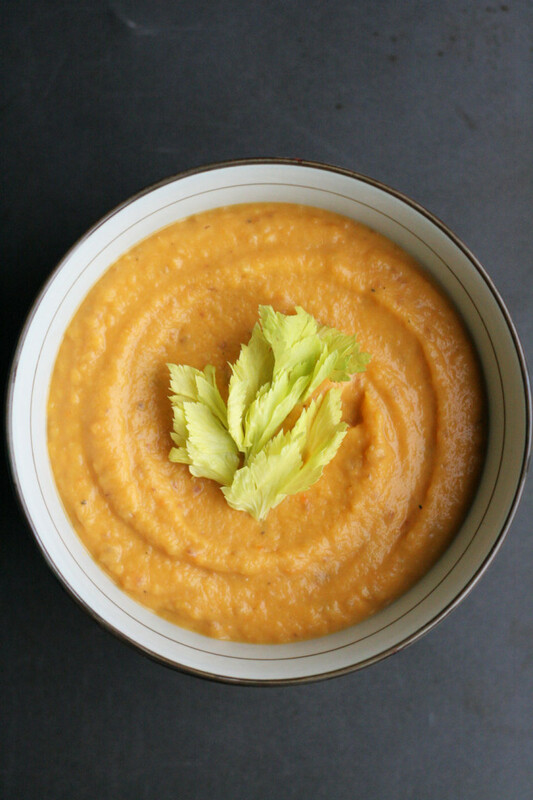 Combining sweetpotatoes and sweet apples for a smooth, but not perfectly smooth Sweetpotato Apple Soup makes sense to me. It’s not that it’s cold outside everywhere, it’s just slowing down here, and that calls for a simple good soup. Oh and add rice or more protein if you wants. There are no rules there, just soup fun. Yes, I think soup can be fun. I’m silly that way. I am about to get slapped in the face with a dose of Summer heat. I am crazy excited to be going to visit my best friends in Sacramento, and it’s going to be between eighty-five and ninety-five while I am there. WHAT?!!!! Ok, I’ll be eating more Summer salads, fruits, and foods while I am there, one last drop California before I come home to much cooler weather. My body may just freak out on me! I find it amusing and am glad it’s the end of Summer there, the nights are beautiful, and while it is freaking hot, it’s that different kind of heat. Not July and August heat, more mellow October heat. At least that is what I am telling myself, as it’s seventy and partly cloudy beautiful at home today. 1. In a large dutch oven or 6 quart pot, add olive oil over medium heat. Once shimmering, add onions, cook for 5 minutes, stirring occasionally. Add garlic, cook for 1-2 minutes. Add carrots, celery, and apples, cook for 5 minutes, stir occasionally. Sprinkle 1/4 teaspoon fine sea salt on vegetables, stir. 2. Add sweetpotatoes, and stock, stir to combine. Raise heat to medium high, bring to a boil, then reduce to a simmer, and lower heat to medium low. Cover and cook for 40 minutes. 3. Turn off heat. Add 1 teaspoon fine sea salt, and 1 teaspoon fresh ground black pepper, stir to combine. 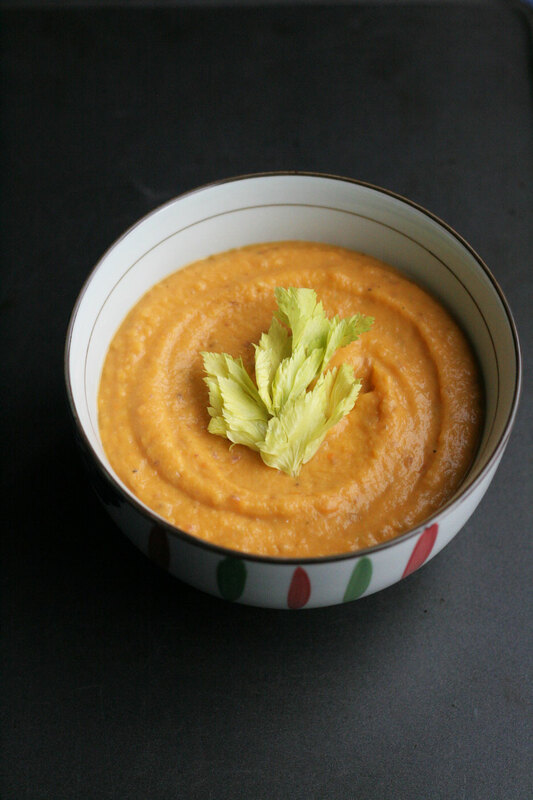 Using a hand blender or working in batches using a blender, blend soup until smooth. If working in batches, place smooth soup back in stock pot once entire batch is blended. 4. Add cream, ground sage, stir and cook on low heat for 5-10 minutes. Taste for seasoning. Serve warm with a few celery leaves for garnish. Gorgeous flavors here! Autumn in a bowl really 🙂 I could just dive right in. This soup sounds delicious! Have made something similar myself – and love the addition of apple to soups. And naturally love fall too! What a perfect combination! Love the color, just the thing for fall and it’s healthy and nutritious, too! What a lovely looking soup! Who needs to wait until fall to have it!? Not me, I’m all about sweet potatoes right now! Ha! Yes, welcome to California, where fall doesn’t exist. 🙂 However, I will still be all about this soup anyway. You have to love the new fall apples and squash!